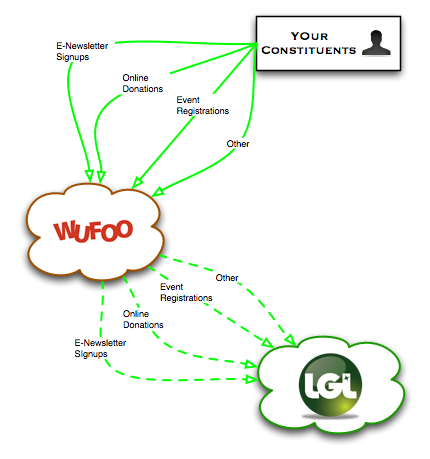 Little Green Light’s integration with Wufoo’s HTML Forms means that you can now collect information from your constituents online and have it automatically entered into your LGL database. Wufoo strives to be the “easiest way to collect information over the internet” and their forms can hosted by them or be deployed anywhere (for instance, on your website). In this article, we walk you through the process of connecting LGL to your Wufoo account and then show you how to configure the forms so that information will flow automatically into LGL. Here is a diagram of how LGL connects with Wufoo. Donation forms: Collect donation details and payments from your constituents online. These donations can be set up to automatically create gifts entries in LGL. 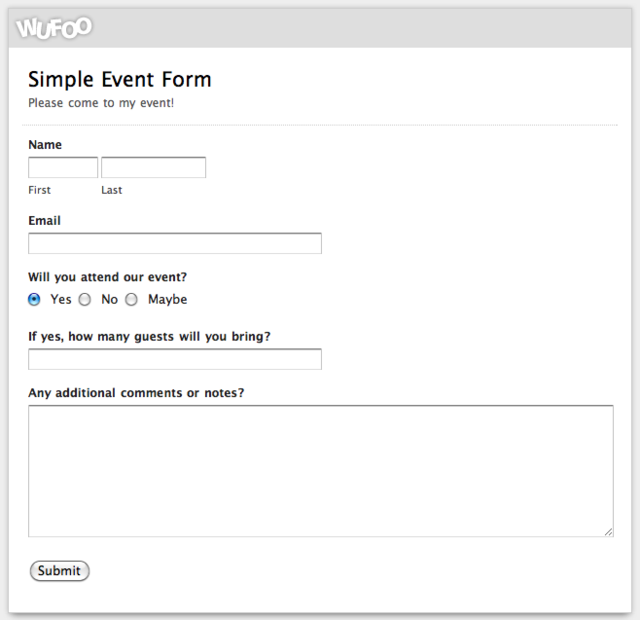 Event forms: Collect RSVP, additional guest, and payment information for any event. Volunteering forms: Collect information about volunteer interests and/or participation. Note: You must be an administrator to use this feature in LGL. If you are not an admin, you will not see any of these features. Click the Check Credentials button to complete the connection. If there is a problem with your username or password you will be notified with an error message. If all goes well, you will see something like this (assuming you have a form or three set up in Wufoo already). If you don’t have any forms in Wufoo already, you probably will want to create at least one. This is also extremely easy to do within Wufoo, and you can follow the instructions provided. The interface is pretty straightforward, but we also recommend looking at Wufoo's extensive help documentation if you have any questions about how to do that. After choosing a form to integrate, you can select our record matching preferences for the form (how will constituent information from new submissions be matched to existing records in LGL? ), and also define the field mapping rules so that the information for each submission will end up in the right place. You can decide if LGL should try to match new records to constituents by email and name, or just name, or both. If neither option is selected, LGL will create new constituents for every submission. All of the form fields from the selected Wufoo form will be listed in this section, and you can map them to the appropriate record type and field within LGL. Many of these mappings will happen automatically if you use the standard Wufoo field names, but if a field is not mapped (if the -- Do not import -- option is selected), then it will be left off. Since this form is a “Donation” form, you would want to check the Include gift fields option, so that you can map the "Payment total" from Wufoo into the "Gift amount" field in LGL. We will cover more advanced topics around field mapping below, but now that you have the basics in place, you can save the form and complete the integration process. Connection: Checking this box will enable the automatic submission of new form entries from Wufoo into LGL. We recommend that you check this box for forms that should have automatic integration (in other words, most forms). Review preferences: Do you want to automatically save new records or add them to a queue for review? We recommend setting this to “Yes” initially to make sure that submissions are happening appropriately. Later on you can update the settings to process the records automatically. Review Queue: There are four possible queues: Constituent, Gift, Event, and Volunteering. This allows you to review and approve all submissions of a given type more easily. Now that you have a Wufoo form (or two) mapped to our LGL account, the fun part begins. If you had existing forms in Wufoo, it is quite likely that you have some entries logged there that are not yet in LGL. If so, the first step is to import them all. You can pull all submissions from a given form into LGL all at once by clicking on the Import all button in the Actions column. This will go out and grab all of the entries in the specified Wufoo form and pull them into LGL for review. As mentioned above, you can save records individually or in a batch. In both cases, the records will be set to a pending state and then imported into your main LGL database. In many cases, a form will describe multiple types of information, so a single record from Wufoo might create a constituent, related contact information, and one or more gifts. It is also quite typical for categories to be added. In this case the bulk save would only affect 1 record, but if you have 50 records queued for review and want to save them all, then this is a big time-saver. Sometimes you will get submissions from your forms that you don’t want to save. For example, if the submission is not valid or if it contains bogus information (like when you are testing), you probably don’t want to save it all the way into LGL. So, in those cases you can reject the records. This can also be done individually or in bulk. All form submissions must be connected to a constituent in one way or another. If a match is not found, then a new constituent record will be created. In the event that LGL does not match the constituent, but it already exists (and you know this) you can override the constituent assignment. To set the constituent, you can click on the icon next to the constituent field, and then search for a constituent within the LGL database. Once this is done, you can save the record and the selected constituent will be updated. 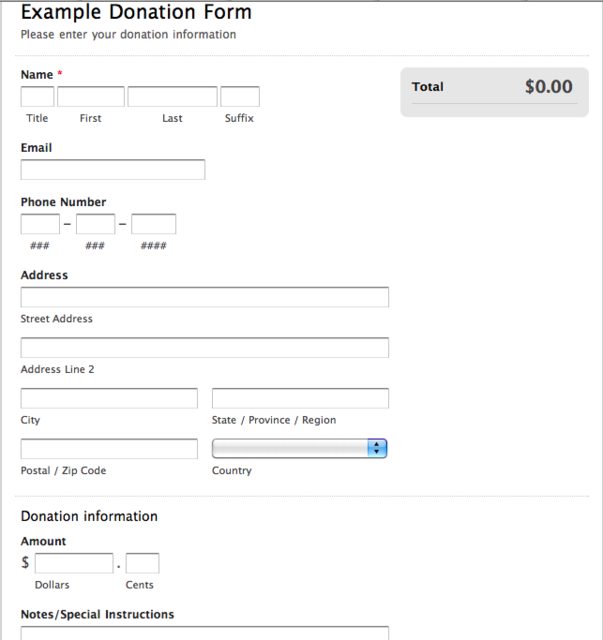 In this section, we’ll review how to set up Wufoo forms to handle donations and events. To set up donation processing within Wufoo, you will need to have an account with one of those providers. It contains basic contact information, as well as a place to add the donation amount and some notes to go along with the gift. As soon as you add the form, you can start mapping the fields (as described above). Which campaign, appeal, and/or fund should these donations map to? You can set defaults that will handle that mapping. In the case of funds, you might want to let the constituent choose from a menu of options there, and then set up the field mapping to assign the choices to the appropriate fund. What is the default payment type you want to assign? Something like “Online” or “Credit Card” probably makes sense. What category do you want to assign to these gifts, if any? This is another kind of default you might want to set. Watch the donations roll in Well, we hope so, anyway! As form submissions come through, they will automatically land in your integration queue, from which point you can save them individually or set them to be processed automatically. New gift records will be created for each “paid” donation, and LGL will poll Wufoo for changes in status to any “unpaid” records. Note: LGL will not save any record with donation information that is not in a Paid state. With or without payment options included, you can connect all form submissions to a particular event. Doing so allows you to collect RSVP information and to take advantage of any custom fields or categories you have defined for that event in LGL, which in turn will cut down on data entry in a major way. With payment information included, you could even handle ticket sales in a fairly basic way. Create the corresponding event in LGL If you want all submissions to go toward a particular event, you need to make sure that event exists in LGL. We recommend that you do this before you connect the form and start the field mapping process. It’s also a good idea to add any custom fields or categories you’ll need (usually this depends a bit on the fields in the form). Using the above form as a foundation to build from, you would want to create an event called “Simple Event” and then add a custom field to track the number of additional guests for each record. Note: you can also add custom categories for an event from this same area, which is a great way to capture menu-driven information from a form. Examples might include sponsorship levels or types that are specific to a given event. 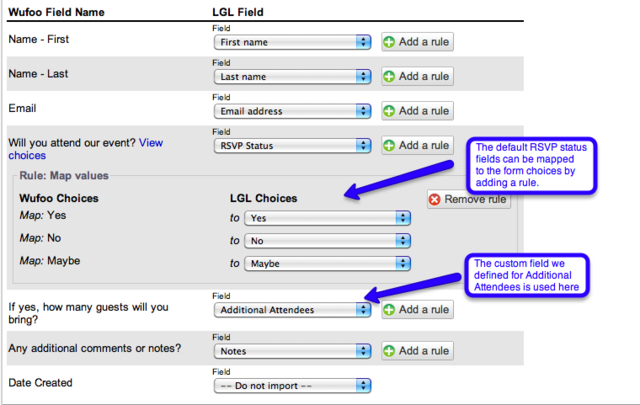 Connect the Wufoo form to the LGL event With your event all set up in LGL, you can now return to the Integration Settings page to connect the form. With that done, you are all set to begin accepting event registrations for your Simple Event. In this section, we cover several useful but advanced techniques for mapping data from Wufoo forms into LGL. Set defaults: Any field can have default values connected to it. In some cases, these values will be directly related to the field in question (setting the "Phone Type" appropriately for a “Cell phone” number, for instance), but in other cases they will only be tangentially related (for instance, if you want all constituents submitting a form to be added to a particular group in LGL). Prepend text: Most text fields will allow you to prepend values. A common use for this is if you want to combine multiple fields into one text field in LGL, and then have a way to identify each value with its original source. You can do this by adding two default values to the email address field, and a similar approach can be used for phone numbers and email addresses. It is quite common for Wufoo forms to have multiple values, either as drop-down menus or multiple-choice selections. These fields can be mapped cleanly to any LGL field that also supports menus (they can be mapped to any field, actually, but we recommend linking them up to known values in LGL if possible). For instance, you might collect information about a volunteer’s interests through a form, and you could map each of those values to a corresponding value in a custom LGL category, like “Volunteer Interest”. The first step in this process is to make sure we have a Volunteer Interest category. You can set that up on the Menu Items page in LGL, and then add the appropriate values. Now your form submissions will be nicely categorized in LGL. We’ve really just covered the basics when it comes to what you can do with Wufoo forms and LGL, but you should now have enough information to get up and running with some basic forms.